Ready for the future of wireless content access. Imagine having the latest novels, magazines, your favorite music, audio-described films, texts and your own voice recordings, all in the palm of your hand. 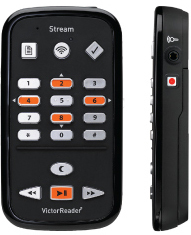 With its new lightweight and compact design, Victor Reader Stream delivers hours of listening pleasure ANYWHERE! Far more than just another audio player, the new Stream’s wireless capabilities open up the world to people who are blind or visually impaired. Enjoy books and music from iTunes. • Power adaptor NA USB-A 5V 1A. • Micro USB cable Short. • Micro USB cable long. • 8 GB SD card.